When we consult a Tarot deck, the Major Arcana cards take us on a journey into another world, accessing ancient truths and divine law. In psychic Tarot readings the Major Arcana cards can describe attributes of people and their character traits, but most often represent the spiritual lessons we go through in life. The High Priestess card, numbered 2 in most decks, is the ‘psychic’ of the deck and also known for governing the entire Tarot deck. It has been said that the waters flowing beneath her feet trickle down into all the other cards in the deck that contain water. The High Priestess card represents psychic knowing, past lives, hidden things, secrets, and the power of silence. This card can point to a person in your life, but more often it conveys a message that important matters may not be clear or obvious yet, and that something is brewing beneath the surface. Often, I will get this card when someone is reliving a past life lesson, or when they need to pay attention to their dreams and intuition. A very popular deck is the Rider-Waite-Smith deck. Rider was the original publishing company based in London, England; Arthur Edward Waite was the creator of the deck, and Pamela Colman Smith, aka ‘Pixie,’ was the artist. Today this deck is the most widely used throughout the world and, in my opinion, the easiest deck for learning the Tarot. 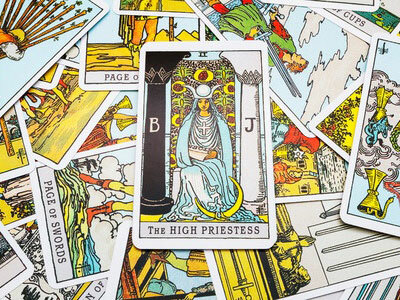 The card imagery in the Rider-Waite-Smith deck of The High Priestess card suggests that she is Persephone, the Egyptian Goddess Isis, the Corn Maiden, or Artemis. She sits before the gate guarding the Great Mysteries with the Tree of Life in the background. She is known for balancing the darkness and the light, represented by the pillars Boaz and Jachin of Solomon’s temple on each side of her. The tapestry hung between the pillars keeps the casual onlooker out and only allows initiates pure of heart to enter. The pomegranates on the tapestry correspond to the story in ancient Greece of Demeter and her daughter Persephone, as a symbol of sacred service or duty. Persephone ate a pomegranate seed in the underworld which forced her to return every year. The High Priestess wears a blue robe, a sign of knowledge and wisdom. The Isis Moon Crown rests upon her head symbolizing the Triple Goddess. The solar cross, or equal armed cross on her breast stands for equality and balance between male and female. In her lap is the half-concealed Torah, representative of the esoteric teachings and higher knowledge. Some Tarot scholars believe ‘Torah,’ and ‘Tarot’ are a play on words and points to the connection of the Tree of Life, the Kabbalah, and the Tarot. The crescent moon under her left foot shows her dominion over pure intuition. The palm indicates fertility of the mind, and the cube she sits on represents the Earth. The planetary association with the High Priestess is the Moon. When many Major Arcana cards come up in a reading, I find that the topic my client is dealing with is highly significant and pertinent to their spiritual growth. These cards weren’t named Major Arcana for nothing! The majors ask us to stop and take a closer look at how we’re interpreting our own story, and to explore ways of viewing our situation from a higher perspective so that we can move forward with clarity and confidence. The 56 remaining cards in the deck are called the Minor Arcana and they are comprised of 40 cards numbered 1 to 10 in four different suits corresponding to the four elements, and 16 royal Court Cards, also known as the ‘people cards’ in the deck. The Minor Arcana help describe our everyday life and the challenges and successes we experience on the human level. The minors give us clues on how to handle the everyday challenges and what actions to take for creating the best possible outcome. When someone has many Minor Arcana cards coming up in a reading, I’ve seen that their outcome is very mutable and that they can alter and shift future events. With Major Arcana cards, on the other hand, it seems to require quite a bit of spiritual growth work on my client’s part to create change. However, Major Arcana cards are not dolling out some sort of life sentence, or punishment, but rather, offer a gift and opportunity for us to be free of a pattern we were unaware of, and help us to evolve and align with our greatest good. We all have blind spots and no matter how much spiritual work you’ve done, the Tarot will grow with you and continue to point the way to enlightenment. Another Major Arcana card that can be highly significant in readings is The Wheel of Fortune card. Many people think of the game show with this title and, yes, on a mundane level this card can mean gambling and games, but the deeper meanings are fate, destiny, and change. This is a very major, Major Arcana card! When the Wheel of Fortune shows up, change is inevitable. Most of the time it predicts fortunate change for the better, and opportunities for increased income, or cases of ‘meant-to-be’ are on the table. Unless this card is reversed, which I will discuss in a future blog, it almost always indicates good change is on the way. To conclude, when Major Arcana cards show up in a reading, it would be most wise to just ‘listen’ – which brings us back to the message of The High Priestess who by example shows us how to be receptive by simply listening to our inner voice for guidance and direction. The Major cards will talk to you if you listen, and as I’ve seen over the last 25 years, they never lie. I truly believe God, Goddess, Universal Source, wants only our highest and best good, and happiness. So, when a Major Arcana card appears in your reading, be open to listening and trust that Spirit has the very best intentions for you by expanding your consciousness and vision, so that you can be the powerful person you were born to be.